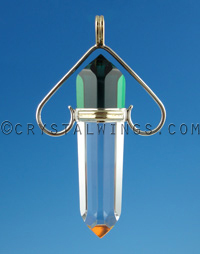 How Should I Choose a Vogel Crystal or Master Healing Tool? From our Website: Take a moment when you will not be interrupted. Create a sacred space: Turn off the phone, close the door, and light some incense or a candle. Before you open our web site,set your intention, aloud or to yourself, of what crystal being you are searching for. Perhaps you need an energy of protection, ascension, or overall healing for yourself or clients. Speak this, hold the energy of that intention and begin letting your intuition guide you to the different pages on the site. When you feel a “hit” on a picture (whether it is because it is visually appealing to you, you feel a physical sensation in your body when you see it, or a vision pops up) take a moment to “communicate” with the crystal and hone in on its unique energy. Continue following your instinct while perusing the site until you feel that you have connected with those beings that resonate (you will feel an energy of completion). By Phone: Do the same exercise as above before calling. You can call us during our business hours to set up a distance resonance test (we recommend setting up an appointment to do this, as we do get busy in the store and may not be able to assist you when you call). A distant resonance test is a exercise that is done to further hone in on which crystal feels right to you. We simply take the items that you are wanting to feel, hold them in a detailed manner so you can mimic the same action, and merge our energies together so you may energetically feel the crystal being. We do not recommend a crystal for you, or choose one for you. We are simply the conduits for accessing the items in the store. In Person: When choosing a crystal in person the same components come into play as through the website. Set an intention of what energy you are desiring, and then open up your senses to receive messages or signals. You may be attracted to a wand because of its physical beauty. That is a profound message, and take note of it. One may pop out in your mind's eye over and over again, as if it will not leave you alone. When you find one you are interested in, hold it and let it in to your energy body. Can I Order Effectively Over the Phone? We have been providing these amazing tools online to the world for over 15 years. We have sold Vogel Crystals, Master Healing Wands, and Ruby Lavender Quartz to thousands of people, from here in the states, to Australia, Japan, Iran, Norway, and beyond. Although it is wonderful and awe inspiring to stand in front of our amazing inventory, we believe that the pull of these tools (and their subsequent intense power) is strong and refined enough to be felt any where on planet Earth. Using your intuition and inner guidance you can absolutely choose a crystal. Use the exercises above for feeling the crystals on the website, or set up a distant resonance test. What If I Can't Choose Between Two Different Vogel Crystals or Master Healing Tools? This often happens for those being called to work in the crystal world very intensely. Many different crystal beings may resonate with you at one time, and you may feel confused at first. First, know that each crystal that you resonate with is right for you. They only have different purposes. No matter which one you choose, you will be bringing a powerful and delightful friend, with awesome benefits, into your life. You need want to do is get very specific about the energy you want. Take turns holding each crystal (or looking at each picture of the crystal), and asking it this question, “What purpose do you have for me?” You may receive an image, a feeling, an emotion, or even words that represent your future work with that crystal. Having a strong focused intention to begin with (when entering the store, or setting the sacred space at home while looking at the website) tremendously helpful. If your starting intention is to feel a deeper connection to love and peace, then one crystal will definitely give you a stronger hit on that intention than another. After going through this sort of personal “interview” ( you are actually questioning yourself, rather than the crystal) you will be able to choose. However if you are still feeling cloudy one of two things may be happening. You may have some chaotic energy that is hampering your clarity. Step outside, clear your energy ( simply relax, spirit is with you ), dig your feet into the earth, and feel your own divinity come over you. When you are in your own awareness, please know you are never alone and your spirit and the spirit of your future crystal friend are already together and with you. The decision then becomes effortless. You actually may be called to get both if you have the means. Sometimes crystals do work in tandem, or work as a team for the intended goal. I Chipped My Wand. What Do I Do? "Foremost, understand that it is NOT a terrible sign of impending doom or spiritual consequences. Leave that kind of thinking to the weak minded. “Tipping” just happens. Perhaps it is only a slight vibrational adjustment to bring you and the crystal in alignment. Whatever….DO NOT be overly concerned. I, after almost 30 years in the business, have not met a strong, active, successful healer or user of these magnificent wands that has not tipped one." A Slight Tip: If there is just a slight tip on the end of your crystal, you may find that the energy coming out seems a bit more comfortable and more attuned to you than before. This is what we call the “initiation,” and it happens quite often (especially with high energy crystals). This happens when the vibration of the crystal needs to be altered just slightly to come into specific resonance with you. Let go of the idea of perfection, and feel it out again. 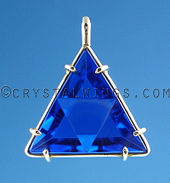 A slight chip will not alter the energy integrity or successful use of the crystal. A Large Chip: If your crystal has been chipped dramatically (perhaps where the top of the crystal is half broken off) you may find that it has a different purpose. We have heard of clients using this ‘wounded' crystal as a healer of other crystals, placing it on a altar to generate energy for the hurt. Because, as we know, quartz is possibly the most balanced substance on Earth, whether it has been altered or not. And when we release our notions of the ‘way it should be' we discover a more powerful and immensely innovative purpose for it in our lives. They are NEVER useless. To reshape your crystal so that the chip would no longer be visible requires a large amount of time and a good amount of money. Depending on the size of the chip the artists may have to completely re-cut the crystal, which would be the equivalent price of a new one in many instances. During our busy season we may not be able to get to a crystal for up to 6 months. Some websites claim that tipping a crystal is an indicator that you did something bad, or out of alignment. A myth circulates even that it might mean the crystal was too powerful for you. This does nothing but reveal the sources inexperience and lack of knowledge when it comes to the beautifully divine nature of the crystal, and what it has to teach us on our journey. All of this is just baloney. Can I Hurt Someone, Or Be Hurt, By These Powerful Tools? Absolutely not. You will no doubt hear plenty of controversy on this subject, because it stems back to the essence of human nature to polarize our existence into good and evil. But quartz will NOT ‘cut' your aura or energy field. You will not be attacked by someone who has less than good intentions who is using it. You will not be able to hurt a client with a crystal (at least energetically!). There a couple reasons for this. First of all, many people who have memories of Atlantis and Lemuria recollect that with the end of those civilizations, these crystals were to be programmed only for the use of positive energy, healing, love and light. If someone with negative intentions should attempt to use one, they would be deactivated, so to speak. Whether you resonate with that notion or not, it is nonetheless interesting to mention. Secondly, evil, negativity, darkness, or bad intentions are merely the absence of the unlimited flow of wellbeing. Quartz crystals are totally balanced, and when cut in these sacred angles into Vogel Crystals or Master Healing Tools, immediately obliterate that which is not positive. Quartz is light. Darkness cannot exist within it. It would be like trying to use water to feed a fire. You cannot use Quartz to feed darkness. Can the Cutter of these Crystals Program a Crystal? No, this is an old sales scheme from back in the 1980's. It takes tremendous talent, skill, artistry, and patience to make these crystals that are in this sacred lineage, whether it is a Vogel Crystal or Master Healing Crystal. But one of the prerequisites to do this work when being trained by Marcel Vogel was not to ‘program' or ‘imprint' a crystal. Such thinking has many flaws. One step into the workshop of one of these amazing artists proves my point. They sit for hours at their blade perfecting a piece. During that time they may think of their wife, their dog, the waitress at the corner diner, and the meaning of life. But none of those thoughts enter your crystal, because your crystal is solid light. It will not contain or hold memories like that. You can, by all means, set an intention with the crystal, but the source of that program is from you, and the amplifier is the crystal. Not the other way around. The crystals and jewelry on our site are no doubt top of the line. The owner has been in the crystal business for over 30 years and brings the best material, artistry, and techniques together for an outstanding inventory that is unrivaled. The material that we use can be both rare and exotic. The Ruby Lavender Quartz is our trademarked stone, and we have the total world supply. When it runs out, it is gone. The quartz that we use for the other pieces has been hand picked by Bill himself (who else could say that!) during his annual travels to South America. He sifts through thousands of pounds of quartz to find the pieces that end up in your hands. The cuts are where the real magic begins, though. Because Bill studied with and was certified under Marcel Vogel he knows how important it is to continue Marcel's lineage, and to bring about new tools that will encourage us to dive into the crystal realms. There are only a chosen few who can cut, shape, and create these tools within the parameters of sacred geometry, and proven science. We utilize this talent, which may not last forever, and that is priceless. Also consider this, these crystal tools will outlast you. They may be carried on to your children, grand children, and great grandchildren. They may lay aside after we are all gone, with the remembrance of your grasp. The power and significance that they hold in bringing us back to our true peaceful center of love and light is worth so much more than a dollar amount. How Should I Care For and Preserve My Crystal? Have a bag or pouch that you use when storing and carrying your piece. When inserting and removing a wand from the bag, be aware of the angle and pressure, as too much of either can chip the tip of the wand. When cleansing your crystal, burn sage, or another favorite smoke of your choosing. If you are guided to use water, make sure it is at the same temperature of your crystal. Extreme temperature changes can crack, cloud, or sensitize the crystal for a rupture later on. When working on a client, and doing intense work, make sure that your hands are free from lotion or oil, as it can cause the crystal to slip out of your hand. Keep the crystal stored in areas with neutral temperature. When placing on your altar, use a pillow or some other soft object. Do not use with other wands, in the same hand. Even slight clinks can cause damage. Only allow others to touch and use the crystal whom you really trust! If you have a pendant, make sure that you carry around a piece of tissue and a small pouch to protect it during each wear. Do not wear with other pendants. Quartz can crack or chip when impacted with other like stones. 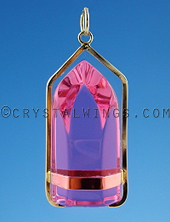 What are the Metaphysical Descriptions for each type of Vogel Crystal, Master Healing Tool, and Ruby Lavender Quartz? (8 Sided,12 Sided, Angel 2, Unconditional Love, etc.)? We decided years ago to relinquish that information. We find that the majority of people get distracted by someone else's vision, feeling, or view of a crystal being. You may feel energy that is the complete opposite from what someone else does when you hold a crystal. These Vogel Crystals and Master Healing Tools (Clear Quartz & Ruby Lavender Quartz) have unlimited purposes and talents, because you do! We find that when we have blanket statements that apply, for instance, to a number of sides, it takes the power away from the client, and from the unlimited potential of the crystal. You are a tremendously powerful being who, no matter if this is your first time purchasing or your 100th, feels and can intuit what is best for you. That is the first initiation with the crystal itself - the choice! Crystal Wings is owned and operated by a student of Marcel Vogel, certified by him in the Vogel Healing Technique. Crystal Wings has been in the crystal business for over 30 years. We know the ins and outs, and we do not need sales techniques to be successful, just great crystals. Largest inventory of the highest caliber crystal wands in the world. Physical store front, as well as convenient online shopping. Staff here to take your orders and correspond with you about your questions. I Have Read Online That Only Certain People Sell the "Genuine" Vogels. Is This True, And Are You One of Them? Before Marcel Vogel's passing, he communicated to Bill Hurley (see his bio here) that he wanted all his students to continue his teachings, and maintain the integrity of the Vogel lineage. This is one reason why he chose to begin certifying individuals (Bill Hurley being one of them) in the healing technique. All that he had discovered at IBM and put into place at the Psychic Research Institute needed to be continued. The dilemma is this: those people who are teaching and providing the Vogel Crystals and the Vogel Healing Techniques are guarded and jaded. Soon after Marcel's death, imitation “Vogel crystals” began popping up out of Brazil at gem shows, and ending up in your local crystal shop. Dealers realized they could sell double terminated, faceted crystals with the Vogel name and get more money for it. The Vogel name began to become diluted, slapped on fake crystals, and in the hands of dealers who sold them with blatant disregard for the genuine pieces. So, the Authentic Vogel Crystal was born. The other side of the dilemma is what began to happen amongst the Vogel followers and students. Much like you may see channelers claiming they have ‘exclusive rights' to an entities information (why someone in the spirit world would give exclusive rights is a mystery to me), some in the Vogel Lineage have tried to create exclusive distributorship of these tools. This is a bit like walking a razor's edge. We want to remain protective and in integrity in the Vogel lineage, but without creating a monopoly of ego. So, you may now see the dilemma. One of the dealers of Authentic Vogel Crystals claims that he is the only one Marcel ‘appointed' to continue his teachings. Marcel had an open heart, and a generous person. He communicated to many students that they should all continue his work and distribution of these amazing tools. Continuing his work through his students provides the momentum needed for creating a new generation of crystal seekers. We provide these tools, as well as being the innovators in the new evolution in crystal healing wands. You are no doubt getting the real deal. For more information about how to distinguish a Authentic Vogel, from an Imitation, read Bill's article, "How Can I Tell It's A Real Vogel Crystal?" Why Do You Not Offer Returns, Exchanges or Refunds? This policy has been in effect for over 30 years in our store. All sales are final to ensure that crystals that you are purchasing have not been shuttled around, but are as close from the mine and the artists hands as possible. It keeps our level of inventory in clarity. Do You Offer Lay-A-Way Plans? Unfortunately we do not. With the large amount of inventory we have, and running the website and store front, we do not have the time to keep track of payments and on-hold crystals. 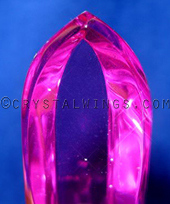 Do You Offer Your Vogel Crystals, Master Healing Crystals or Ruby Lavender Quartz Wholesale for Retailers? As far as we are concerned the items on our site are already at wholesale prices! We try our best to keep the prices low in comparison to the expense of traveling, hand-choosing the material, designing and having it shaped. Providing a wholesale program would require us to have room for a 2 tiered system, and we would rather deal at the lowest price possible for all. Why Flat Rate Shipping Prices? At this time shipping an item in the US is $20, or internationally is $40. Each item does vary in weight and size, but we use the same heavy-duty packing material to protect our items on their journey. This flat rate pricing includes packaging the items extremely well, cleansing and sageing each crystal that leaves our store, and fully insuring your package. How Do You Package Items Before Shipping? With every item we take tremendous care in safely packing it for its journey to you. We use heavy-duty boxes and make sure to insulate your piece of jewelry or your crystal with plenty of packing peanuts. Who Do You Use as Your Primary Shipper? We use the United States Postal Service, and always elect for Priority mail with Delivery Confirmation and Full Insurance. We can use another shipping provider if you so choose. Call us for specific pricing. We do offer USPS Express Mail, or UPS 2nd Day Air, 3rd Day Mail at an increase in shipping price. Call us for exact pricing and details. We are unable to do overnight. Yes, absolutely. There may be some limitations based upon the country that will alter our ability to fully insure the package. We can only ship out of the US using the United States Post Office. Can You Claim the Package as a Gift on the International Customs Forms? Unfortunately because of what is required by international customs we cannot claim your item as a gift, or at a lower amount, without risking the value of it if it was lost or damaged. What If an Item is Lost or Damaged? Before each package leaves our brick and mortar store we inspect each piece to make sure it is intact and meets its online criteria. If an item happens to arrive damaged, call us immediately within 24 hours of receiving the item, and we will give you the information to begin a claims process with the shipper. Because we insure each package, you will be reimbursed for the worth of the item should they rule in your favor. We claim no responsibility for the item once it leaves our hands. If your package is lost, or does not arrive on time, refer to your shipping confirmation email that we sent to you with the tracking number, or call us to get that information.